Victory for Scunthorpe – the Unity First returns! Over a year ago we documented a campaign by Scunthorpe United fans to have their traditional ‘Unity Fist’ badge restored. When we last spoke with Scunthorpe blogger Matt Blanchard, it seemed as though there was real momentum behind the campaign. Seeing supporters of a proud lower-league club campaigning for the restoration of a badge central to their identity was something we could relate to, despite being 142 miles away. On 25th June 2014, the Unity Fist made its long-awaited return to the shirt of Scunthorpe United as part of a commemorative green strip. The Iron’s ‘third kit’ for the 2014/15 season will celebrate the 20th anniversary of a supporters’ club in Ireland and will feature the Unity crest. This decision was a victory for Scunthorpe fans, and a victory for their club’s identity. We got in touch with Matt to find out more, and to congratulate him on the campaign’s success. The Unity Fist has returned! The club have decided to use the Unity badge on the third kit for the forthcoming season. The kit is a special commemorative shirt that celebrates 20 years of the Irish Iron; a supporters group over in Ireland. They have always used the Unity fist as part of their logo and on their merchandise, so it seemed fitting that it was included in some way. That’s fantastic news. Is this a compromise from the club? Yes. The club’s commercial department have been really good in pushing the idea. They’ve taken the idea to the board and thankfully the new chairman – Peter Swann – who really likes the Unity fist, gave it the green light. The majority of fans would love it to be a permanent change and in the Chairman’s latest notes to supporters it seems as though the club will be giving fans the choice for next season. I’ve worked alongside the club throughout the process to ensure the kit would be one the fans would be happy with and thankfully they all seem to be! And what about the opposition you have encountered – are those fans who told you to ‘concentrate on the players’ happy with the change? I think 90% of fans are happy with the clubs return to the Unity Fist. There are some who suggest the kit looks like a goalkeeper shirt, but they forget that the club are limited in what kits they can have because of a deal that ends at the end of this season. Thankfully, the club are looking at changing kit providers so we can have much more flexibility in terms of kit design which can only be a positive. What was the biggest factor in the return of the Unity Fist? I think the main factor was the support we received on Twitter and on the messageboard. There were lots of people suggesting it should happen and there were rumours last summer that something could happen, but it never materialised. I think the commercial department realised that this will be a big seller and that it’s what the fans wanted. Introducing it as a third kit gives the club the opportunity to test the water and reflect our club’s heritage. It seems as though the club are starting to listen to fans and credit for this must go to the Chairman (Peter Swann) for doing so. He regularly holds meetings and ‘Q&A’ sessions with the supporters. He openly admits that he reads our messageboard to ascertain what the fans want; it’s a great approach. There aren’t many chairmen in the Football League as open as Peter Swann, and this can only be beneficial for the club and its supporters. And the end result is a return of Scunthorpe’s traditional identity and a money-spinner for your club? Hopefully. It will be interesting to get some figures as to how many are sold. I think the fans will really buy into it and if they do, I think it could be a return to our traditional Unity crest across the board, which would be a great result for the fans. What would you say to those fans saying things like ‘the players are all that matter’ and ‘results are everything’? Everyone is entitled to their opinion and I suppose you can’t please everyone. For example: some people think our new ground looks great and is much needed, whilst others can’t seem to get their head around the concept. I think the majority of fans are happy and hopefully the ones who aren’t as pleased will come round to the idea! Have you been following developments about our quest to restore the traditional badge at STFC? Yes, I have. The vote taking place at the moment is a great opportunity for your fans to reclaim their true badge and right the wrongs of the clip art logo. I wish you all the best with it. I hope the Loggerheads return as soon as possible. … and what would you say to STFC fans? Quite simply, if your fans feel strongly about your identity then it is vitally important that they vote ‘Yes’. Admittedly I am not a Salop fan, but surely there can’t be any credible reasons to vote against changing the badge? I think your vote will come back with a favourable outcome. What is important then is that the Bring Back The Loggerheads campaign works with the club to ensure that the new badge is something that supporters will like and that represents your club. Thanks Matt – we will do our very best! Scunthorpe’s victory in having their traditional badge etched onto a third strip is a great accomplishment. Congratulations to fans of The Iron and also officials at their club who recognised this appetite for change and responded to it in a timely fashion. The end result is win-win for both supporters and the club. A restoration of identity will please many of their fans, and SUFC will also benefit from increased sales of the new shirt. We wish our friends at Scunthorpe United FC all the best for the season ahead – hopefully we will meet them in League One in a year’s time! Scunny’s green third kit commemorates 20 years of the ‘Irish Iron’ supporters’ club and features their popular Unity Fist emblem. Well done lads. It is unfortunate that our battle for the return of our badge has been a more arduous journey with years of malaise from club officials. Despite this, we are nearing a historic set of vote results which will determine the outcome of the ‘badge issue’ one way or the other. We urge all STFC supporters to continue to ‘VOTE YES’ with only 3 weeks remaining. We are nearer than ever before to removing the infamous, irrelevant clip art logo and bringing back our true badge once and for all. Shrewsbury Town supporters are not the only ones campaigning for a return of a traditional club badge. Following the appointment of a new director at Scunthorpe United, fans of The Iron have called for their old crest – known as the ‘Unity fist’ – to be reinstated. This much-loved emblem was removed two decades ago after it was thought to have negative connotations. After a stint using the town coat of arms, Scunthorpe eventually introduced a new badge in 1994 and it is still in place to this day. It seems slightly strange that the above emblem was removed due to potentially having violent undertones and yet its replacement features an equally menacing image of a sturdy hand tightly gripping an iron girder. Many fans of the Glanford Park side would like to see the current 3D logo removed and replaced by the old emblem. We can certainly relate to this sentiment. We spoke to Iron-Bru.net administrator Matt Blanchard for some more information about Scunthorpe’s admirable badge campaign. Hi Matt. How long have you been following Scunny? I have been supporting Scunthorpe since the late 90s. My dad took me to my first game in 1997. And there’s now a campaign amongst your fans to restore Scunny’s traditional emblem? Yeah that’s right. The traditional emblem was the Unity fist, but it was wiped out in the late 1980s as it was deemed too violent by some of our board members. The fans have never really taken to the 3D badge. I think we are the only club in the country with one! Every supporters’ club use the 2D fist and the newly formed Iron Trust also use it. Fans on the terraces have donned unofficial merchandise with the 2D badge on for the last few years and there is a really strong opinion amongst the fans that it should return. Where has this campaign come from? It’s been a long running gripe. Fans have made their feelings clear on Iron-Bru for many years but it’s just never been taken as far as it is now. The 2D fist is our identity. With the chairman supposedly leaving in the summer it’s a chance to regroup, take stock and really make the fans see the club in a positive light again. It would signal that the board is finally listening to the fans for the first time since I’ve supported the club. It’s all about soul, tradition and unique heritage. Do you have any statistics for us? We ran a poll on Iron-Bru.net and 80% of respondents were in favour of the 2D crest making a comeback. What about those not in favour of it? What reasons have they given? There have been a few people that suggest that we have bigger things to worry about but like I said its about the heritage and soul of Scunthorpe United FC. I am quite sure that the club would benefit in the long term. They should see it as a positive investment – merchandise sales would improve and most of the fans would be pleased. There are also some who would rather we brought back the Town’s coat of arms, which we used for a couple of seasons before the arrival of the 3D effort. I think most of the people who are against it are not necessarily against the change per se, but aren’t really bothered about the badge either way. Do you think that the ‘modern football mentality’ is seeing more fans prioritise league positions over a club’s identity? I’d say that this is probably the case, although there is a desire amongst Scunthorpe supporters to regain some of the soul and passion attributed to the Unity fist. The Cardiff re-branding has brought on-the-pitch success, but the club has totally sold its image. I also know some Hull fans who aren’t keen on being known as the ‘Hull Tigers’ to appeal to the Middle East market. I suppose you’ll always get the fans that don’t care if things are going well, but there are plenty who also value the identity of clubs in this country. Why do Scunthorpe fans value the 2D fist so much? What does it symbolise? The Unity fist has always been a striking and recognisable symbol of Scunthorpe United. You won’t find Manchester United, Liverpool or Barcelona messing about with their badges. Some say “it’s only a kit” but real football fans know the difference and it’s about soul. As a small club we were all part of the [Nigel] Adkins era and united in that very special adventure we had. It would be good to see the return of a badge which reflects this unity. From an objective viewpoint, what do you make of Shrewsbury Town’s current badge? How does it appear to the outside supporter? I have always known you as Salop with the three Loggerheads from the days we used to meet before our rise through the divisions. It was instantly recognisable, as was the unique motto on it. I’m slightly confused as to why there is a large lion on your new logo. I like simplicity, but no club should ever use a clip art image within its badge. Do you think Scunthorpe United supporters would tolerate a badge made from clip art without any relevance to your club’s history? No I don’t think so. Before any changes are made to a club’s unique identity (and I see no reason why this should ever happen) its fans should be heavily involved in any decision making process. Maybe this is what happens when you get people making decisions without understanding the importance of history? We’ve had the same board for a long time and I think it’s just a case of them being stubborn rather than anything else. Communication has improved slightly with the arrival of Dennis Hobson [new director] and there is now a regular dialogue between Scunthorpe United and its fans. They have never really been challenged on the badge issue and hopefully they will as the new season draws ever closer. It is possible that supporters who have previously declared “I don’t care about the badge” may be reading this interview. What would you say to them? I know people will have their own opinions but I think changing the badge is hugely important to move forward. With the chairman leaving it is a change for us to rebuild an allow the fans to be more active in the running of things down at Glanford Park. If we can convince the board to open their minds to the idea of the Unity fist, it would give our fans major encouragement. Reinstating our old badge may seem like a little step, but it should be viewed as a very positive one indeed. In my opinion it’s a case of the sooner, the better. A quick browse of their most popular forum reveals some striking similarities between the Bring Back The Loggerheads campaign and the efforts of Scunthorpe fans. Their fans appear to have adopted an old crest as their badge, regardless of the club’s official choice. We’ve done the same thing with the Loggerheads. UNITY: Anyone for a half-and-half scarf…? A poll they’ve conducted suggests a widespread support for the Unity fist with 80% in favour of its return. The latest badge poll on our messageboard saw 79.2% of respondents plump for the return of the Loggerheads. They too have encountered some small opposition from fans making banal comments like “changing a badge won’t increase attendances” and “you’ve had years to do this, move on”. There seems to be a real groundswell of support behind the Unity fist and hopefully their campaign will go from strength to strength. We would like to thank Matt Blanchard for taking the time to answer our questions. We also hope that Scunthorpe United can avoid relegation on Saturday and that their fans are ultimately successful in restoring their true emblem. Floreat Salopia. Refulget labores nostros coelum. “You’ve got our fans arguing with each other!” – really? Quite recently a young Town supporter on Twitter (who proudly displays the clip art lion on his profile background…) launched a bizarre attack on the Bring Back The Loggerheads campaign. He insinuated that “arguments” were being caused by the continuing calls for STFC to reinstate its true club badge. We do not believe this is a fair accusation. After all, to “argue” with someone implies that both parties offer forward valid reasoning, ultimately with the aim of persuading the other to change their opinion. This is not the case in Salop’s ongoing badge issue as there has never been a sustained/credible argument in defence of the clip art lion logo. We’d love to hear one, but ultimately it does not exist! Whenever there is a clash of opinions regarding the club’s crest, there is usually a standard pattern which is observed. Reasoned and heartfelt pro-Loggerheads sentiment is either met with an outright misconception (e.g. “we’ve had loads of badges”) or a banal comment like “it’s the club’s decision at the end of the day”. Having thought about this, there has definitely been a noticeable change of tact amongst the handful of Town fans who appear to oppose a change of club crest. A few years ago, any muted cry of “bring back the Loggerheads” (whether over a social network or a chat in person) would have prompted a series of mistruths in response. There’d have been the old classics like “the council have banned the use of the Loggerheads you know!” or the ridiculous “the new badge magically earns the club more money”. Thanks to the good work of Town fans who refused to accept this corporate guff, such fallacies have been well and truly defeated. Now, the club apologists only have a couple of automated responses to our rallying cries. Both of these well-worn comebacks are inherently flawed. We totally agree that the players (and their on-the-pitch performances) are very important, however they are not the be-all and end-all of Shrewsbury Town FC. Soul, heritage and identity are equally important to many of us who do not want Salop to become the next Cardiff Red Dragons. The second retort – this “I don’t care anyway” malarkey – is an interesting one. If you truly don’t care about which badge represents us, then why the hell are you even involving yourself in the debate? This contradiction is the equivalent of a bloke declaring “I don’t care about the environment!” before having the nerve to comment on Green Peace party policy. We appreciate that some will not have strong feelings about STFC’s choice of badge, but if you genuinely don’t care, surely you’ll have no objection when it eventually changes? The battle for a crest which adequately reflects our heritage will continue! It is about OUR club, OUR town and OUR badge. A few weeks back, various supporters’ groups gathered at the New Meadow for the club’s once-every-two-months forum in which grievances are aired and answers are occasionally given. As has been the case during the majority of these positive meetings, the conversation eventually turned to the troublesome issue of the clip art lion and a potential return of the Loggerheads emblem. In attendance was Mr Martin James; who it must be said is doing sterling work in attempting to improve communication between the club and its fans. According to the minutes posted on the STFC website, Mr James toed the party line with regard to the “badge issue”. He reaffirmed that the club have “officially” confirmed that a future re-brand will take place and that Shrewsbury supporters will be involved within this process. Great news, or so you would think. Bloody awful! The short-listed new kit designs leave a lot to be desired. As many will be aware, Shrewsbury Town have encouraged supporters to submit their designs for next season’s kit. While an excellent idea in principle, the short-list makes for harrowing viewing: you’re faced with a bland Ipswich-style shirt (as above) or a knock-off version of Boca Juniors’ strip. Along with a disappointing selection there is also the undesirable influence of the clip art lion which will deter many from dipping into their pockets. The unveiling of next season’s kit choice was met with understandable disappointment on the blue-and-amber messageboard: one fan’s verdict of “crap designs and an even worse logo” appeared to hit the nail on the head. In light of the continuing cries for a return of the Loggerheads, it seems madness to persist with the clip art lion. One can only assume that the club are hoping that, by shoving the corporate logo on the latest shirt, fans will accept that “it’s here to stay” and finally give up the ghost. This will not happen! The Bring Back The Loggerheads campaign will persist for as long as necessary, even if we have to persevere until the new shirt has expired in two seasons’ time. Is now an inappropriate time to campaign for a re-brand? Absolutely not. The club have the perfect opportunity to correct their mistake from six years ago, produce a badge we can be proud of and enjoy greatly increased sales of official merchandise. All they have to do is delay the launch of the new shirt and go about the process with due care and diligence. The alternative of course is that they release one of the aforementioned new clip art designs as scheduled and in doing so waste more money on a now condemned brand. The shirt sales will be disappointing and the moans will continue for many months ahead. I would implore those at STFC to give this option serious consideration. They have already accepted that a return of the Loggerheads is imminent due to the strength of feeling surrounding this issue: why delay the homecoming for several years? Stop the new shirt selection in its tracks and do what must be done! For those who may be unaware, this particular emblem is generally regarded as a slightly embarrassing footnote from the club’s recent history. Introduced in 1986, this bland badge lasted only five seasons before being ousted after a campaign amongst Town fans involved with the popular A Large Scotch fanzine. The Loggerheads were promptly reinstated and remained on Shrewsbury shirts until the infamous clip art lion surfaced in the summer of 2007. While there are a handful of Shrewsbury supporters who remember the ‘Shrew’ badge with nostalgic affection, it cannot be compared to the Loggerheads in any way, shape or form. The Loggerheads have been affiliated with the town of Shrewsbury and its football club for generations, whereas the camp ‘Shrew’ had arrived and disappeared within just six years. The famous three leopard heads, along with the motto Floreat Salopia (“May Shropshire Flourish”) are fundamental components of our local heritage. Any attempt to compare the ‘Shrew’ badge with the Loggerheads is as ridiculous as a hypothetical Manchester United supporter, having been asked about their club’s best ever goalkeeper, responding with “sod Peter Schmeichel, what about Massimo Taibi?”. The former is remembered fondly and with pride, whereas the latter may prompt a cringe. 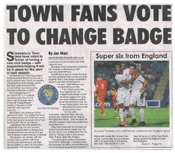 Our campaign to change Shrewsbury Town’s badge has received fresh coverage following a superb article, penned by supporter Nick Statham. In an eloquent piece entitled ‘Why a Club’s Badge Matters’, Mr Statham provides a concise overview of the Bring Back The Loggerheads campaign and manages to highlight the wider importance of a badge in relation to a football club’s identity. Everything is under constant change. Nothing remains the same as time passes and all things are impermanent. The only constant in the Universe is change; it is inescapable. Since starting this piece only a minute or so ago, I have aged. I have shed skin cells, lost brain cells and my heart has beaten dozens of times. The process is unstoppable. However – does that mean I should totally forget the past as it has gone, will never return and is forever consigned to history..? I think not. The past gives us a sense of who we are, where we are, where we are going and our beliefs and allegiances. I was born in Clun. I am a Shropshire lad and proud of it. I grew up in Shropshire, was educated in Shropshire and have represented Shropshire at sport. Alongside these aspects of my heritage, I am also a lifelong supporter and follower of my local football club, Shrewsbury Town. They are the team of my County and Town. In contrast, I know nothing of Millwall other than it is an area of London and their team is referred to as ‘The Lions’. They play at the New Den and their club badge – predictably – features a lion. Other than that I know nothing of Millwall. However, every other Saturday during the football season I am reminded of my non-existent knowledge of Millwall FC. When? This club springs to mind every time I walk through the car park at the Greenhous Meadow and notice those two giant clip art logos attached to the Roland Wycherley stand. This is my personal justification for why the new badge (which is now commonly known under the derisory sobriquet of “clippy”) must go. We need a club badge which depicts Shrewsbury Town Football Club; it needs to be designed and adopted sooner rather than later. I want to wear something which reflects Shrewsbury Town and there is plenty of available inspiration: the River Severn, the castle, Laura’s Tower, the Welsh Bridge, the motto ‘Floreat Salopia’ and – of course – the famous Loggerheads. A club badge should enable a supporter to be proud of their allegiance through it. If “clippy” does that for you, fine! No problem. It simply doesn’t do it for me. Bring Back The Loggerheads. Why is a logo important..? A logo has a veritable impact on an organisation’s identity. For most groups it is a way of easily identifying a group in a quick and visual way. The classic example of this is the McDonald’s M-shaped logo; there is no mistaking it and everybody knows exactly who it represents. 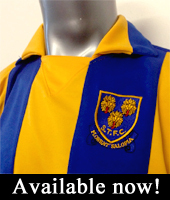 This is precisely the problem with Shrewsbury Town’s new ‘lion’ badge and, in the years since its introduction in the summer of 2007, there have been numerous anecdotes of Salop shirts being mistaken for those of other clubs including Millwall and Chelsea. In addition to causing confusion amongst fellow football fans, the new logo has also proved largely unpopular with Shrewsbury supporters. The key problem is its embodiment of generic artwork, and there is now a shared consensus that the badge was based upon a clip art lion which was readily available on the internet. In design terms, using generic artwork is a big error. It is not illegal or anything, but it doesn’t show any level of creativity or fulfil the objective of creating a unique identity for the individual company. Using clip art would naturally be perfectly okay for a poster advertising a village fête or a school barbecue – but a business or large corporation should not really be using it. I think people who know a little about design will look at the new logo and think that it’s highly unprofessional and not sending out a great image of the club. There is also a financial element to the Bring Back The Loggerheads campaign; many suspect that the club is losing out on revenue as a result of fans refusing to buy official merchandise. While the logo may only seem like a small aspect of the club, it is vital that supporters are able to identify with it and currently many appear unable to do so. The small minority of fans who have defended the clip art logo have suggested that changing the badge would simply be too costly a process and may even reduce Graham Turner’s playing budget. I’m afraid I have to disagree with this theory. STFC has clear aspirations to eventually make it into the Championship; a division in which clubs have much bigger fan-bases and turnovers. In order to compete at this level, the club would need to examine new income streams which can’t possibly be generated locally. This is where corporate sponsorship comes in. The STFC “brand” could be redeveloped to attract new sponsors from outside the Shropshire region and this change would help make the club more attractive from a commercial point of view. A new badge could easily form part of this process and the crests used by Swansea and Norwich demonstrate that it is very possible for an emblem to be created which both satisfies business requirements and yet retains a clear connection to its local area. 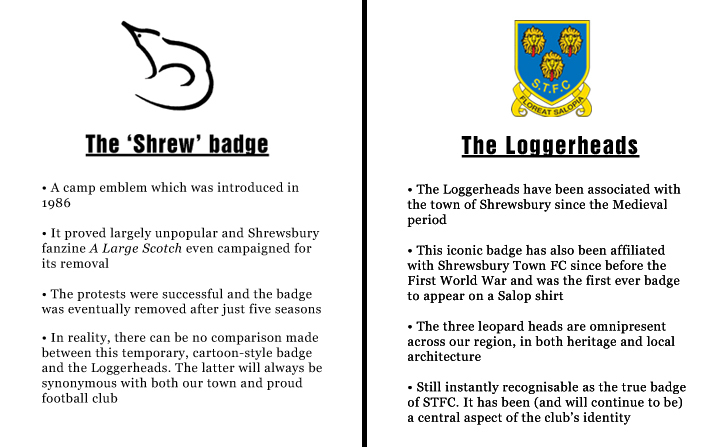 In short, a competent designer could surely produce a badge which incorporates the Loggerheads in some form alongside other aspects of Shrewsbury’s identity as a town. Certain club employees have falsely speculated that it is impossible to copyright the Loggerheads, although my understanding was that as long as the elements within a logo were unique or custom designed, you can do so without any difficulty. This has since been confirmed by a representative of a well-established design company. For me, the current clip art badge doesn’t really provide a representation of what STFC is all about. After five successful years at the new ground – in which we have achieved promotion and seen the club placed onto a sound financial footing – now might be the perfect time to consider our next steps as we move towards Championship football. Upon hearing that a fellow supporter had some iron-on Loggerheads patches available, I had no hesitation in buying one from him. A £2.60 PayPal transaction and a day for postage later and it had arrived. Ironing it over the clip art monstrosity we have on the shirt at present was easy; a quick tea towel over the badge and a hot iron on top for five minutes and it was job done. I can now wear my shirt with pride once again. No surrender. 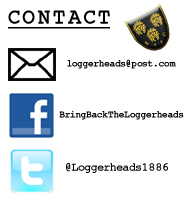 Bring Back The Loggerheads! Oh, what a fine badge! We are Shrewsbury Town. A fine old club, with a proud and lengthy history. And a monstrosity of a badge representing us. The official reasoning for the change in badge was that the Loggerheads emblem could not be legally trademarked, and as such the club were powerless to take action against opportunists using the badge on unofficial merchandise. Personally, this argument has never held much sway with me. Were we regularly competing against the elite clubs in the world, in the multi-million pound industries of the Premiership and the Champions League, I would probably concede that there may be a need to adapt. But with infringement of any real significance coming only with high profile games, such as big cup draws and play-offs, I fail to see this as important enough to justify such violation of the club’s history. I did not start supporting Shrewsbury for the glory. Historically, our level is probably somewhere around the top half of the third tier, and for many of my generation of supporters, even this level has seemed a lofty dream, with mid-table mediocrity and relegation battles in the fourth division more par for the course. Had glory been my sole aim, big, successful clubs such as Liverpool, Aston Villa and Manchester United are within an hour and a half of me. A large part of my support of Shrewsbury comes from the pride I feel towards the town that I grew up in, and that I will always call home, wherever my life takes me. There are many factors in this hometown pride being translated across to my team. The cries of “Salop, Salop,” the club’s blue and amber kit, and the cautious mentality of Shropshire locals which is reflected in the team’s supporters; ruminative and philosophical in defeat, pessimistic and wary when victorious, always anxious that these serve merely to provide greater heartbreak in the future. However, undoubtedly the greatest link between town and club is the glorious Loggerheads badge. This connection dates back over centuries, and the Loggerheads are omnipresent across our fair town, from council buildings to bridges, engraved on park gates and benches. They also lend their name to The Loggerheads on the corner of Church Street, the finest public house I have ever had the pleasure of visiting. 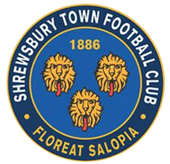 The Loggerheads’ former inclusion in Shrewsbury Town’s club badge, coupled with the phrase Floreat Salopia (May Shropshire Flourish) elicited a pride that I find difficult to communicate into words. Perhaps the best example of this pride was when we lost in the play-off final to Bristol Rovers in 2007. Though crushed at the defeat, when I reflect back upon the day, the first thought that springs to mind is not anything that happened during the match, but the glorious sight of a 50ft flag featuring the Loggerheads being flown on the pitch pre-match. This awesome spectacle forced me to hold back tears at the time, and in the days after our defeat it caused me to reflect on the immense achievement the team of 2006-07 had achieved by even reaching the final. By contrast, when we reached the same stage again two years later, a flag featuring the clip art logo was flown on the pitch, at which point a friend and I engaged in a silent protest by turning our backs to it as it was flown past us. In this instance, a team featuring the likes of Grant Holt and Ben Davies had underperformed in only getting to the play-off final that year, with automatic promotion the clear aim. Perhaps this was a factor in explaining why after this defeat I felt anger rather than pride, but it was here where I realised quite how much the club’s identity contributes towards my enjoyment of the team’s success. Supporters of Shrewsbury have had to put up with a lot of change in the last few years, most notably the move away from the picturesque, largely terraced Gay Meadow to the 10,000 all-seater stadium on Oteley Road. Though this change proved painful at first, recent years have seen commendable moves from the club to ease this, such as a more flexible approach to standing in the ground and a brightening up of the bland concourses beneath the West Stand. The return of Graham Turner has seen us finally return to the third tier after a 15 year absence, and having such an eloquent, well-respected figure in charge, whose status as a club legend cannot be questioned, has helped bring a feeling of warmth and positivity back amongst the club’s support. The return of the Loggerheads in some capacity would only heighten the good feeling that currently exists around the club. I dream of the day they return, and with the amount of positivity around the Bring Back The Loggerheads campaign, I am convinced that this day may not be far away. Keep the faith. Loggerheads forever, clip art never!